I work at an inner-city high school who seeks to serve one of the most vulnerable populations in our society today: African-American teenage boys. The school has Franciscan roots- it was founded by Franciscan friars in the 60’s before the passage of civil rights and still keeps Franciscan as a part of its name- although the friars no longer lead the school. I have worked at the school for a year now. Through my entire relationship with the school I have been continually challenged with the living tension between privilege and poverty. I am a Franciscan sister and that makes me one of the few people in the school community who has studied Franciscan history and seeks to live the spirituality daily. I pray over the stories of how Francis and Clare turned away from their own material riches for a deep spiritual and material poverty. Seeking to follow Jesus more authentically, the founding parents of our Franciscan family contemplated the meaning of our God Jesus being a poor man and then let their contemplations change them. In extreme simplicity and generosity they brought their contemplation to the largest communities and inspired others to follow The Way. Francis and Clare countered their own pasts, their families, misunderstandings, popes, crusades, and the generally violent and greedy ways of the world to persistently stand up for the privilege of poverty. Clare took the holy resistance to her death bed and grave, literally. While she was dying Pope Innocent III finally approved her rule (which allowed her Poor Ladies to live without owning anything) and then she was buried with it. Father Francis and Mother Clare, I beg you, help me understand: why struggle so greatly to live and die with poverty? At this Franciscan High School, privilege and poverty seem to be polar opposites tensely tugging at our life together and our efforts to help young boys grow into men. Yesterday another parent of one of my students told me that she wasn’t sure if her son could stay at the high school because of the expensive tuition. Enrollment has decreased drastically this school year and many of my colleagues now must join the ranks of the unemployed. As I prepare for the first day of school, I feel overwhelmed with the fact that I do not have enough proper desks for my students and a classroom computer with consistent internet access. I am unsure what school supplies I can justly require my students to provide for themselves. I want so desperately for my students to have the same opportunities as teenagers who study in secure, stable, and privileged institutions. It would be a dream to hear my students squabble about where to go for their band trip instead of the fact that the computers in their lab don’t work. On that note, it would be amazing if the school had a band! From this experience, St. Clare, it seems ridiculous that you brought a fight with the papacy over- as you called it- “the privilege of poverty” to your death bed. What is the privilege? Are we set free from something if we give all away? Does it allow us to know something different? What type of enlightenment and union with God comes from owning nothing? I struggle. How can one serve and care for others adequately if they have nothing material to offer, but instead are totally relying on the generosity of others and the goodness of God? How can we be respected and accepted enough to be listened to if we have less, little, and/or appear to be the least? I don’t know- it’s a mystery to me. Yet, I have observed and experienced some of the indescribable answers in my lifetime so far, so my faith and following continues. In my life I have been blessed to have danced with some of the richest of the rich and the poorest of the poor, both. I have slept on a dirt floor at a crowded orphanage in Soweto, South Africa with over 20 children who had never slept in a bed. On the other end, I have slept in the presidential suite at the Hotel Bel Aire. While studying in South Africa, I remember one day that brought me to an elegant evening sipping wine with the upper-class after a day of prison-ministry and assisting run-away teenage girls with their homework at a shelter. Naturally, after such opposite experiences, one of my greatest passions is economic justice and building bridges between the classes. Yet, I must promote Franciscan values. I love telling the stories of Francis and Clare and how they gained such great liberty from embracing the poor Christ. I love teaching about systemic injustice and how we can respond and help build the reign of God. It is a joy and honor to introduce my students to people who are homeless around Chicago and encourage them to donate to organizations like Catholic Relief Services and Heifer International. It is a blessing to pray with the young men to the poor Christ for the strength to be peacemakers in God’s good world. Is it fair to try to teach young men who are growing up in housing projects that poverty is a spiritual mystery? How can I possibly promote- or even accept- that it is a joy to have nothing or little when our society defines success by materials and security? What if I know that my students would be enriched by having more? Or, would they? If poverty is a privilege, then I hope and pray that this school year God’s holy poverty enables the school to have all it needs. May we be set free from the values of our culture and be continually converted to The Way. May we be open to learn all that we need to, and trust that we have all that we need in order to learn. Through it all, may my students become who God made them to be, people living in the tension of privilege and poverty building the reign of God. 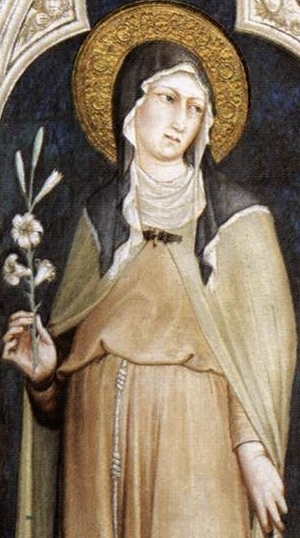 St. Clare, pray for us. St. Francis, pray for us. St. Alexander of Hales, pray for us. Amen. Hey, Happy St. Clare Everyone!!! Thanks for this reflection, Julia. I also struggle with the “privilege” of poverty. I’ve committed my life to “living simply,” initially due to a tight budget, and now because it’s become part of my value system, as I’ve realized that possessions can’t make me happy even if I can afford them. But I was never in a position when I couldn’t afford the basic necessities of life — and there’s a huge difference between the blessing and privilege of choosing to live simply and actual, soul-crushing poverty in which your whole life is consumed with whether you’ll be able to pay the rent, feed yourself or your family, etc. In such circumstances, I think spirituality can sometimes feel like a luxury one doesn’t have time or space for. And so many possessions, including an education, can be part of helping an individual or a group with the sense of their own dignity than can put them in a position to give to others. Thanks for sharing these reflections, they don’t lead to easy conclusions.